Our Lady of Vilnius, NYC: A New Mention in the Blogosphere! "Baltakis agreed with Cardinal Edward Egan’s decision to close the West Village church. “When the Holland Tunnel was built, people were displaced, and only a small community remained,” said Baltakis. After many years of decline and an expensive repair bill, the church was closed. Vocal demonstrators have vowed to reopen it. “Most of the demonstrators were never from the parish,” said Baltakis. I visited Sergey's blog and commented. It would help if some other parishioners did the same. I personally don't know whether to contact Sergey about becoming a journalist myself or just sit down and begin to write my wildly original potboiler about the Catholic Church, "The Jonynas Code." It's sad to see Cardinal Egan's misrepresentation of facts repeated over and over. It's even more distressing to see Bishop Baltakis' comments on the history of a neighborhood he is not so familiar with. Would Philip Johnston have designed his apartment building on Spring Street for a neighborhood with a dwindling population? Would Donald Trump's controversial cond/ hotel be built in a no man's land? It is certainly not true that the neighborhood is shrinking - and you can be certain that some of the new residents are Catholics in need of a local parish. The argument commonly made for closing the church is that it is not a geographical community of Lithuanians. The church was founded for Lithuanians. 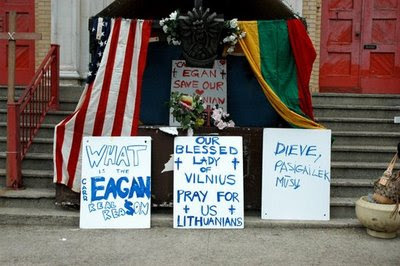 Since there are no longer many Lithuanians in the neighborhood, there should no longer be an Our Lady of Vilnius parish. It is of no consequence that the parish has merit, that it is self-supporting, that it is beloved by people who are not Lithuanian. Does a mother who intends for a son to become a doctor have him done away with if he becomes a plumber instead? Can't a parish evolve? Doesn't the Church have room for the Holy Spirit's work?